A profitable, yet easy-to-learn method of creating cash flow is to buy and re-sell properties in back-to-back closings. However, flipping properties in this manner requires you to KEEP WORKING. When you stop working, the cash flow stops coming in. Rather than flip properties for all cash, flip them for some cash and a promissory note that pays you monthly income with interest for years and years. Obviously, you need the cash to buy the property. Most people buy properties using a mortgage loan, which means you need enough cash flow from the sale of the property to pay off the loan you borrowed. Enter the wraparound formula. A “wrap” is a transaction that involves leaving the first mortgage in place and creating a new loan to a buyer which is secondary to the first mortgage. The payments come in from the buyer, and you make the payments on the underlying loan still in place. 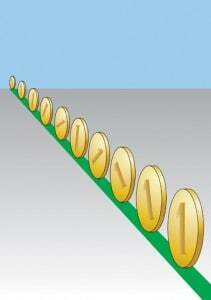 There is a “spread” between the two payments which equals cash flow to you. Most agents equate a ?nothing down? offer with a buyer who is not serious. Example: Buy a property worth $100,000 for a discounted price of $90,000. Put 20% down ($18,000) and finance the balance of $72,000 at 9% with a conventional loan. Your principal and interest (“P&I”) payment is about $580.00 per month. Resell the property for $110,000, taking a down payment of $15,000 and a $95,000 note at 12% interest. You collect about $977 per month. Your cash flow is almost $400 per month ($4800/year), with just $10,000 invested (figuring $5000 in closing costs.) That’s 48% annual interest on your money!. This deal is definitely “cookie cutter” and easy to do, but I said “no money or credit.” Here’s the solution: find a partner to put up their money and credit. Step 1: Locate an open-minded investor who has good credit and provable income. Step 2: Form a limited liability company (“LLC”) of which you are both the members, 50/50. Step 3: Locate properties in nice middle class neighborhoods available for 10% or more below market. Step 4: Execute a resolution from the LLC that your investor member will purchase a particular property in is name, for the benefit of the LLC. Have the investor purchase the property in his name, using his credit and down payment. Step 6: Execute a land contract to the new buyer. Step 7: Collect monthly cash flow and split it with the investor. In the above example, you so all the legwork and you split the cash flow with the investor. When the investor is unable to obtain any more loans, find another investor, rinse and repeat. Copyright 2002-2010 All Rights Reserved. Published with Permission of Author. This article is provided courtesy of the REIClub, a club for people with an interest in Real Estate Investing. No part of this publication may be copied or reprinted without the express written permission of the Author andREIClub.com. See Bill Bronchick’s feature, 7 Reasons to Use a Land Trust.